Heavens, thank god for these Chocolate Nut Energy Bars, that’s all I can say! We did the Snake Lane 10 Mile Race at the weekend and all that got me round was knowing that I had a box full of these beauties waiting near the finish line. Bibi was bounding along, chatting away to everybody (like she does) but I was below par from the start. I had a cold earlier in the week and am guessing I’m not fully recovered. I couldn’t get my zing about me to safe my life so I settled instead for my Zen. OK, so I was having a crap run, with a cruel headwind doing runners no favours, and I was never going to get a decent time. I had to switch my head elsewhere. You’re running in a beautiful place surrounded by lovely people, I reminded myself – how bloody lucky is that?! AND thanks Pocklington Runners for having the foresight to provide a great mug at the finish line. 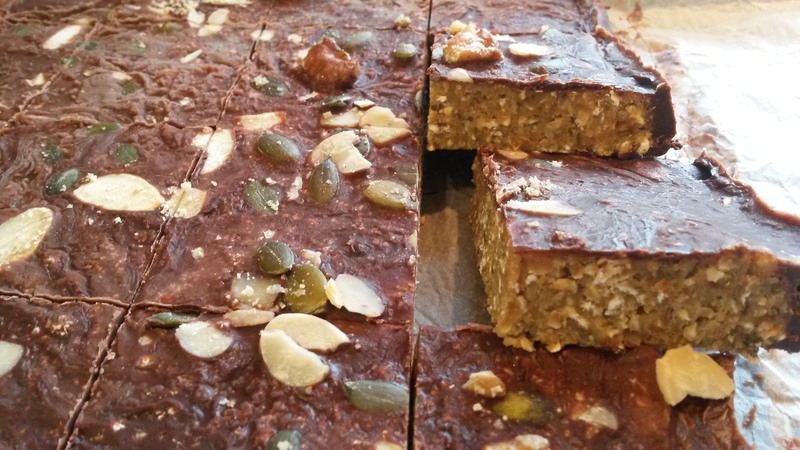 Perfect for a nice cup of tea to have with a delicious energy bar! Note: it goes without saying, I suppose, but just in case – use vegan dark chocolate to make these vegan! 1 First chop the apricots and soak them in the water for about 15 minutes. 2 Meanwhile, toast the nuts and seeds for a few minutes under a medium grill. They’re done when the pumpkin seeds start popping! 3 Keep a handful to one side for decoration then put the rest in a food processor with the oats (or use a stick blender). Buzz the mixture until it resembles breadcrumbs. 4 Add melted coconut oil, pinch of salt, the apricots and the water they were soaked in. Buzz again until all of the ingredients are combined (the mixture should resemble cookie dough). 5 Spread on a greaseproof paper on a baking tray and put to one side. 1 Place all of the ingredients in a bowl and stir well (if you don’t, the coconut oil will separate slightly when it cools. No biggie – it will still taste great but it won’t look as pretty). 2 Pour the chocolate topping over the bars, lifting the sides of the greaseproof paper if it runs over the edges (again, no biggie – it looks cool dribbling over the sides). 3 Sprinkle the nuts you saved for decoration on top then pop the tray in the fridge for at least an hour before slicing. 4 Cut into 16 squares and ENJOY! Yum, these look delicious! Will have to add them to my list. There’s nothing like a tasty treat to greet you at the end of a grueling race. These beat my banana and peanut butter sandwiches! Those energy bars sound amazing!! I’ll have to have a go at making them. They look so naughty, but they’re actually not! I love it!